← Abortion? What About Divorces and a Third Marriage? This is an easy one, I think. You can take a stab at it in the combox, or test your guess and follow this link for the answer. This entry was posted in Astronomy, Other Places. Bookmark the permalink. Actually, Gavin, Kansas City is larger in terms of square miles than a city like Boston. 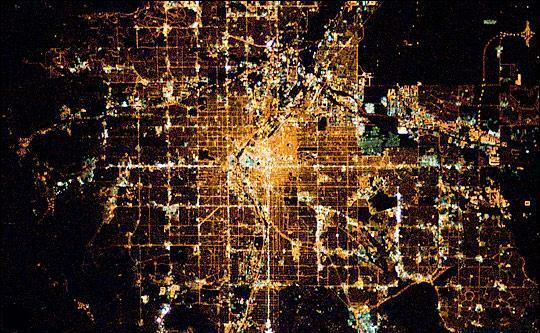 I would guess from the regular grid patterns that it is a mid-Western city. The correct answer is very fascinating. I liked the one for Sin City; I see the figure of a multicolored ice hockey goalie in an action pose. Kewl. Never would have guessed, though it makes sense when I look at it after finding out.